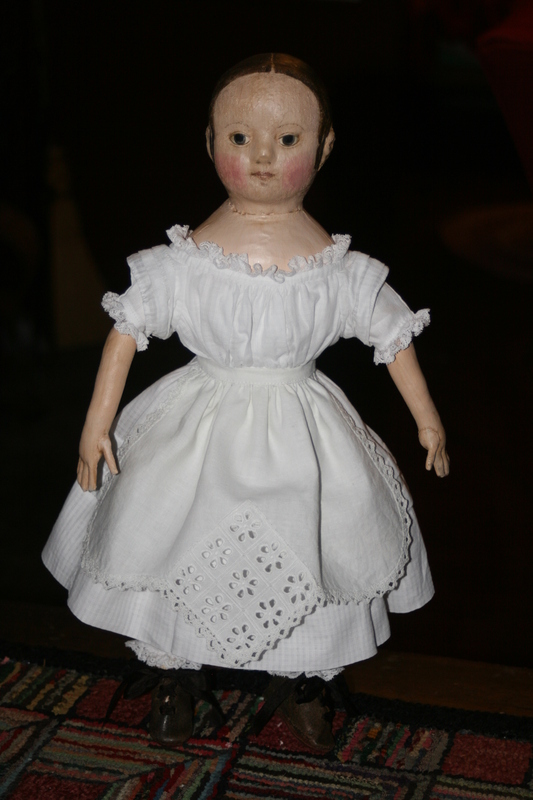 Happy 199th Birthday Izannah Walker – Part 2 PARTY FAVORS! Ismay will draw 18 winner’s email addresses out of the hat tomorrow 9/26/16. If your name and address are drawn you will receive either a magnet with Eliza Jane’s photograph, or a set of two canning jars so that you and your own dolls can preserve a bit of autumn’s harvest. The canning jars also make charming vases for tiny wild flowers and herbs. I have 9 sets of canning jars and 9 magnets to give away! You must have a United States mailing address. So, so sorry, but international postage rates are really high and much more work! I’ll ask for your mailing address when I contact you to say you’ve won. You must get your email in to me by midnight Eastern Time on 9/25/16 and you must email, replies to this post do not count. Good Luck!!! Ismay and I hope you win! Cloe was very taken with Isabeau and Zanna’s canning jars. Enter the contest to have a chance at winning one of nine sets that I am giving away as party favors! Click on any photo to see it enlarged and read the caption. Zola and Hannah canning tomatoes. The girl’s don’t often use the electric stove, but they make an exception for canning! Wash and slice cherry or small paste tomatoes in half lengthwise. Place tomatoes on parchment paper-covered cookie sheets, skin side down. Sprinkle with sea salt. Bake in your oven on the lowest temperature setting available (150 – 200 degrees), until the tomatoes reach the consistency of raisins. If you start them in the late afternoon or early evening, then they will usually be done first thing in the morning, however the amount of time will vary with the size of the tomatoes and your oven temperature. I would suggest trying this the first time during the day, when you can check their progress every few hours. After the tomatoes have dried, remove them from the cookie sheet and pack them in clean sterilized canning jars. Heat olive oil to just below boiling. Pour the hot oil over the tomatoes, leaving ½ inch headspace at the top of the jar. Place a clean sterilized canning lid and ring on the jar, tighten, then turn the jar upside down. The heat from the oil should cause the jar to seal. After you hear the lid make a popping noise – which means that it has sealed – you can turn the jars right side up. Once opened, store in the refrigerator. After picking tomatoes of any size and variety, wash, cut off stem and blossom ends, as well as any blemishes and roughly chop. Place tomatoes in the largest enamelware pot that will fit in your oven. Fill the pot to the top with tomatoes. Place the uncovered pot in your oven and bake at the lowest temperature setting (150 – 200 degrees) until the tomatoes are reduced by half. Depending on the size of your pot, this can take up to 24 hours. Stir the tomatoes once or twice as they roast. You may add sea salt to taste if you so desire. Once the tomatoes have cooked down, but are still hot, ladle them into clean sterilized canning jars, cap with lids and rings and process in a water bath canner for 15 minutes. Save The Date – My Annual Celebration of Izannah Walker’s Birthday on September 25th! 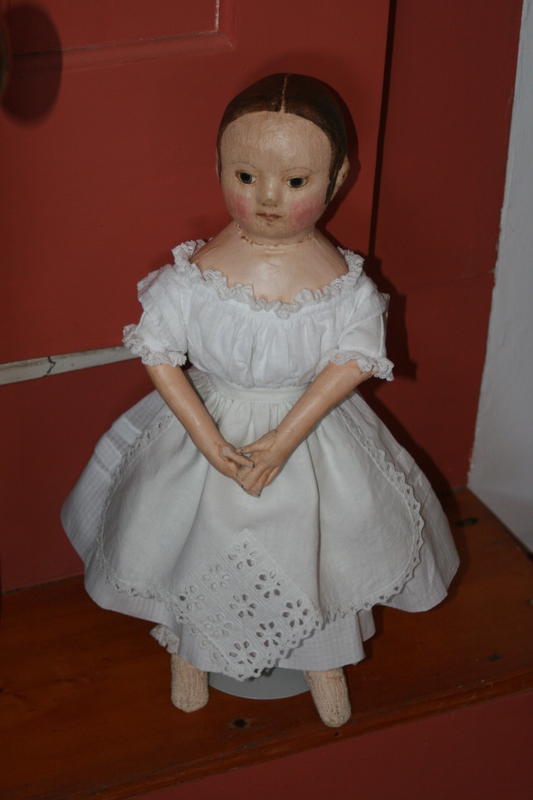 I’ve just finished the doll that I have been making for Denise. Here are some of the photos that I have taken to remember her by. She is dressed in layers of pure white. Two ringlets in front of each ear and seven across the nape of her neck. 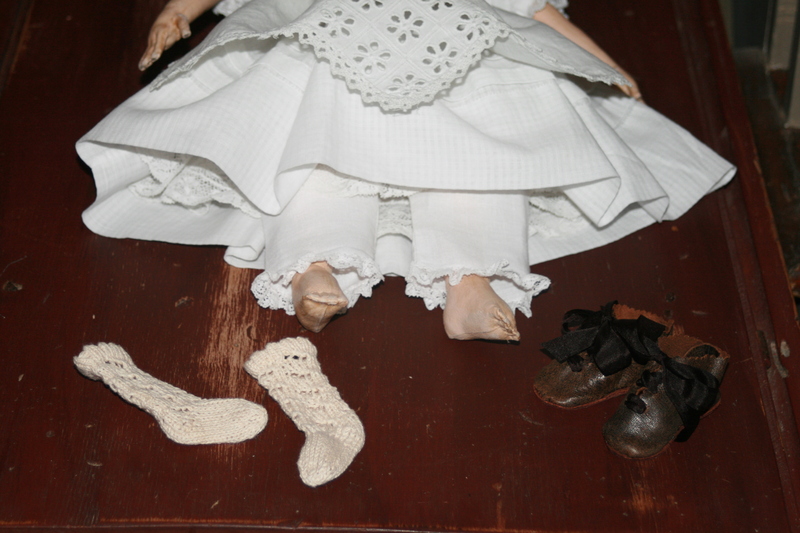 Tiny bare toes, hand knit socks and hand made leather shoes. 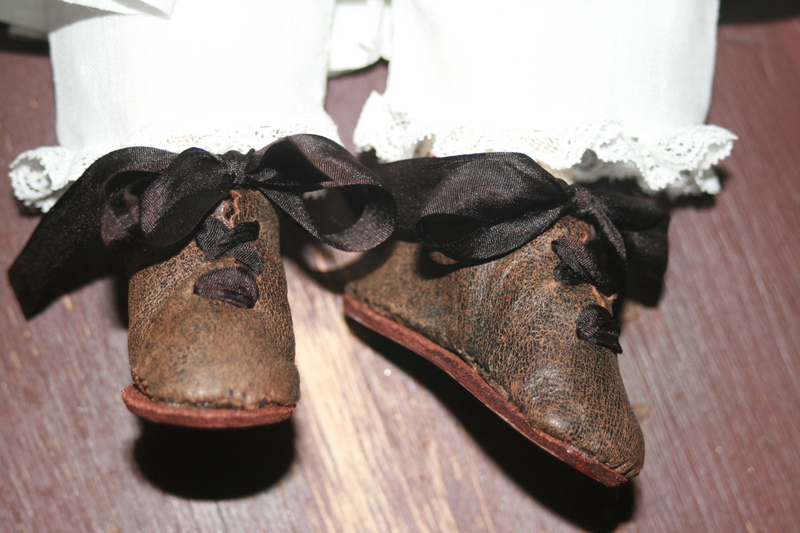 Her shoes have scalloped tops and hand dyed silk ribbon laces. Click on any of the smaller photos to enlarge. If you are using Firefox you can also zoom in by pressing Ctrl and + . 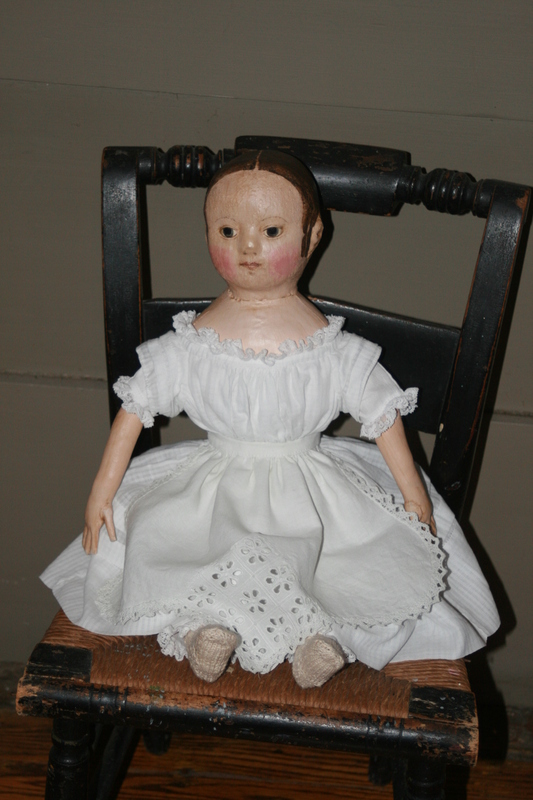 I’ve just received the most lovely note from Denise, which I am sharing so that I can say how very special my customers are and how happy it makes me to create my dolls for them. I am truly blessed. “Thank you so much, Paula!! My doll is home, and just wonderful in every way! I love how you did her dress with chemise peeking out, her shoes, her curls, everything. You must be the incarnation of Izannah! I’m so happy to have her, and thank you again. One last parting gift, a keepsake coral necklace.